CRISM’s investigations begin with sunlight reflected off the Martian surface. CRISM breaks this light into a spectrum, from which it measures 544 colors. The wide range of colors enables CRISM detect minerals on the surface, and the sensitivity of CRISM's detectors - its counterparts to the device in a digital camera that senses light - to infrared as well as visible light extends mineral discrimination based on color to wavelengths not visible to the eye. If you’re interested in trying spectroscopy for yourself, enter the lab here. Electromagnetic radiation consists of energy - the shorter the wavelength, the more energetic the light is. Electrons in a mineral can absorb this energy but only at specific energy levels and wavelengths characteristic of a specific chemical compound. 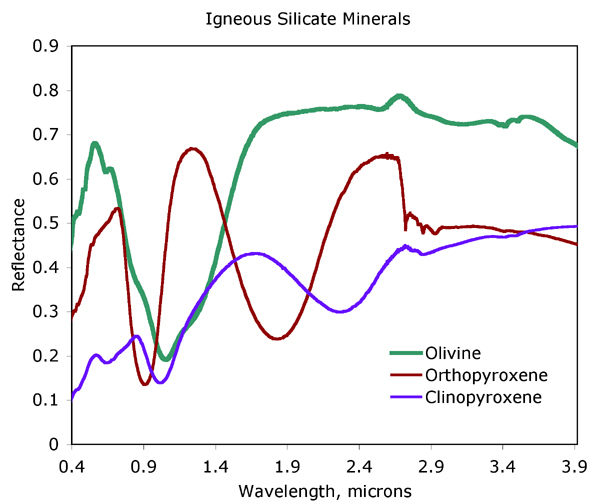 In reflectance spectroscopy, the Sun provides light that is reflected by a mineral, and a spectrometer like CRISM measures the amount of light reflected at different wavelengths. Three of the main minerals making up igneous rocks on Mars are olivine and two kinds of pyroxene. These minerals have absorptions near 1 micron and 2 microns, respectively, and their exact wavelengths and relative strengths indicate the mineral composition of the rock. One of the main groups of minerals that form by weathering of igneous rocks is oxidized iron minerals. There are several kinds of these, and which mineral formed tells us about the environmental conditions during weathering. 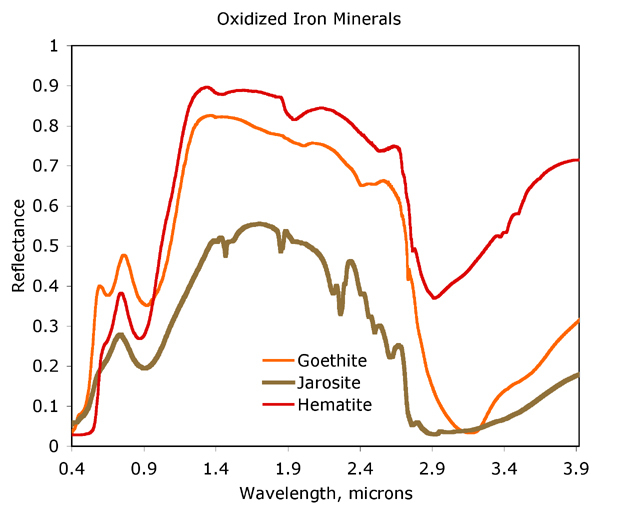 Oxidized iron minerals are most distinguished by the wavelengths and relative strengths of absorptions at visible wavelengths (0.4-0.7 microns) and in the infrared out to 1 micron. Two major groups of minerals formed on Mars due to alteration by water. One of these is clay-like minerals, also called “phyllosilicates”. These minerals indicate a prolonged, wet environment, and oftentimes a warm and wet environment. 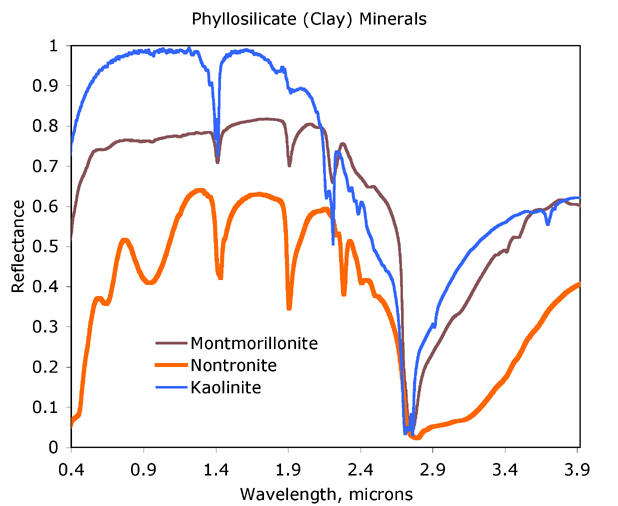 Clay-like minerals are recognized by absorptions near 1.4, 1.9 and 2.2-2.4 microns due to water or hydroxyl that is trapped in the minerals' crystal structure. Another mineral group common on Mars that formed by alteration due to water is sulfates. In general, these minerals indicate a relatively acidic environment. 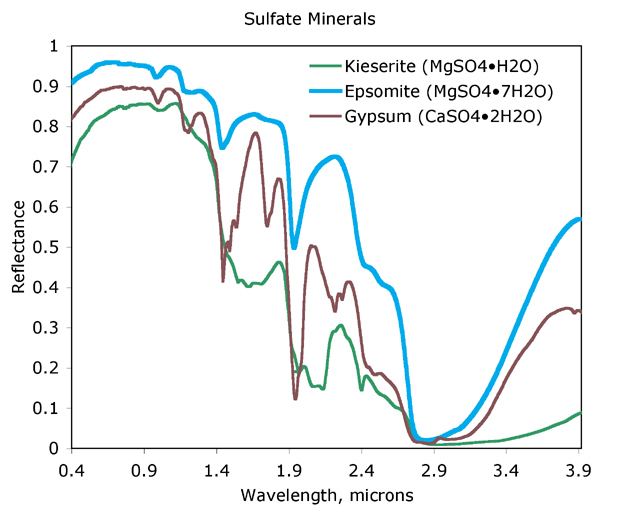 Sulfates are recognized from numerous absorptions from 1 to 2.5 microns due to water in the minerals' crystal structures. There are many varieties of sulfates that differ in the amount of water they contain, and they can be distinguished by the shapes and wavelengths of the absorptions.